The Emerald Princess includes staterooms of all types, ranging from interior cabins to elegant suites. Almost 1,100 cabins are on the outside (about 800 with balconies) and 434 are inside. These pictures from around the Emerald Princess cruise ship demonstrate how lovely the common areas, lounges, and outside exterior of the ship are. Art auctions are a common activity on cruise ships, and the Emerald Princess exhibits its art for sale in the corridor on deck 5. 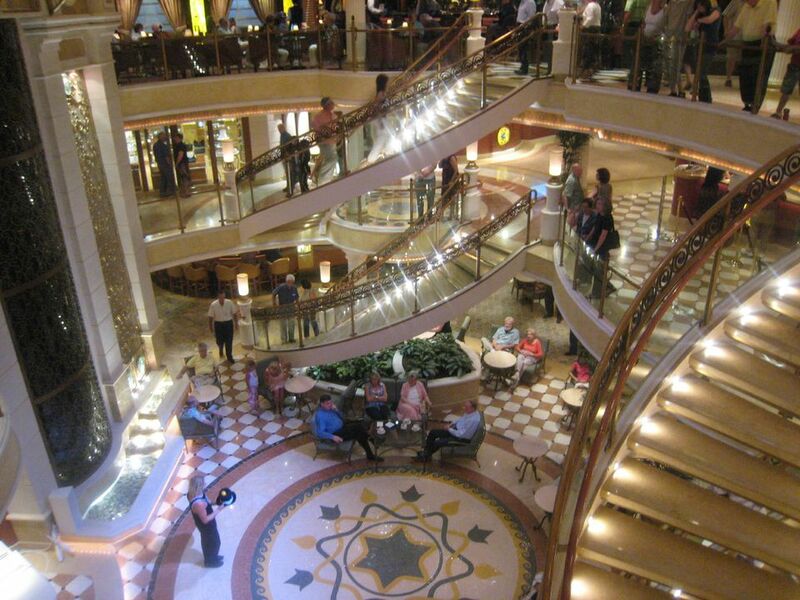 The Atrium on the Emerald Princess is a hubbub of activity, with street entertainers, casual cafes, and always something to watch. The bridge officers control navigation of the Emerald Princess from the bridge. Cruise ship business or family groups will find this conference room on the Emerald Princess useful. The staff and crew of the Emerald Princess have their own pool and sunbathing area on this deck at the front of the ship. The Crooner's Lounge overlooks the Emerald Princess atrium and serves great martinis and other cocktails, many of which are named for famous "crooners". This elegant elevator lobby demonstrates the classical decor of the Emerald Princess. One of the classical touches on the Emerald Princess is this outdoor Promenade Deck, which is perfect for taking a stroll in the fresh sea air. Although the Emerald Princess is a big, busy ship, some areas such as this one are quiet and good for reading or visiting with friends. One of the quiet areas on the Emerald Princess cruise ship is this hallway outside the Explorers Lounge. The library on the Emerald Princess is small, but the book selection is good for its size. A map of the itinerary or a GPS screen would be a nice addition. Princess Cruises introduced big screen movies by the pool, and the movie features continue to be a popular nighttime entertainment option. Most cruise ships have a large observation lounge on the front of the ship, but Emerald Princess has Skywalkers Lounge/Night Club aft. The Emerald Princess allows smoking on the port side of some lounges, and the Speakeasy Cigar Lounge is also open for those who love a good smoke. Located just off the atrium, Vines offers wine, sushi, and interesting small bites of food in a casual setting.